When planning any trip the most important thing to consider is your accommodation, apart from how you are going to get there of course. 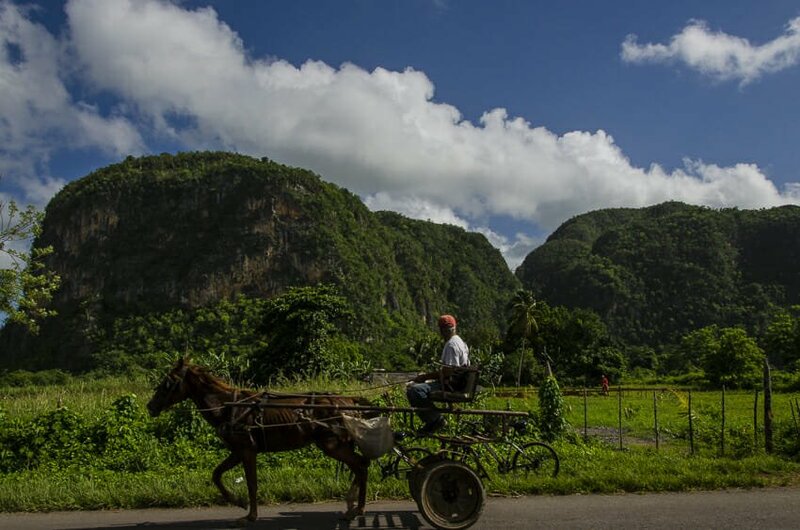 In Cuba it is even more crucial since there is not as much information available on the big wide web in terms of reviews and recommendations or even booking sites as there are for more well-travelled countries. Don’t worry, we are here to help you. 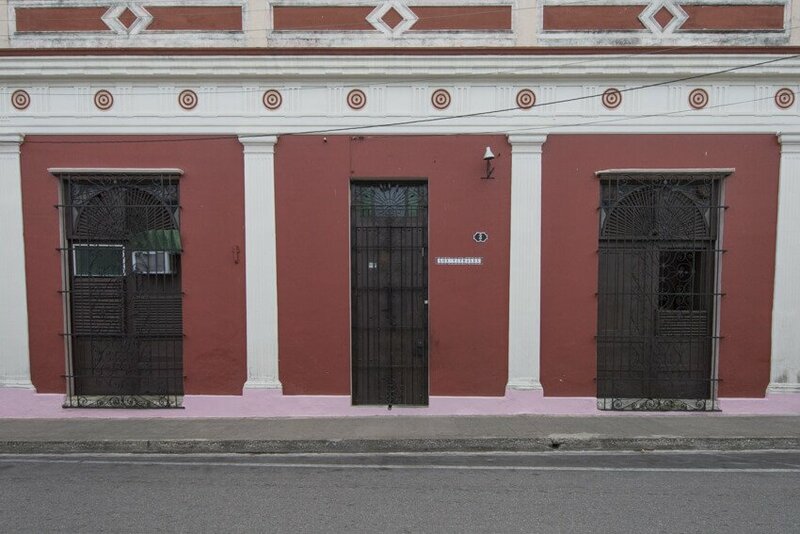 Casas particulares are the answer to all your accommodation needs in Cuba. 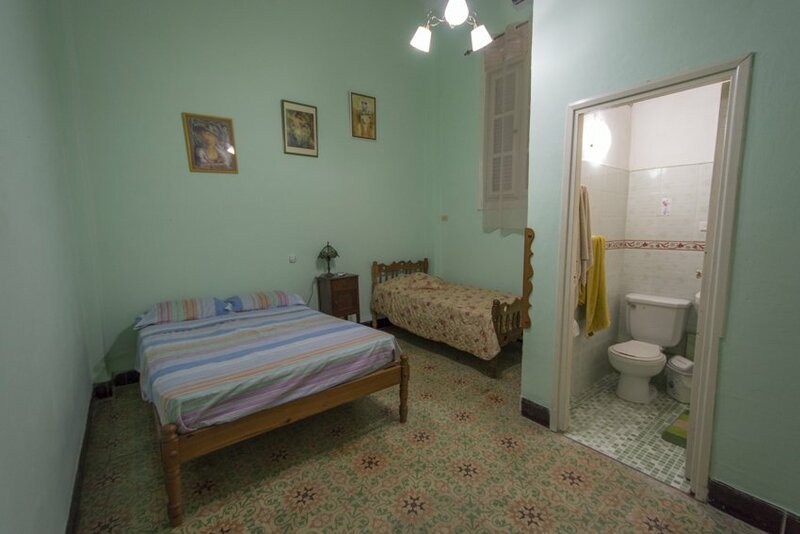 In our opinion there is no other option when it comes to accommodation in Cuba. There is no better way to get to know the locals and to gain first-hand knowledge of recommendations for places to eat and things to do. 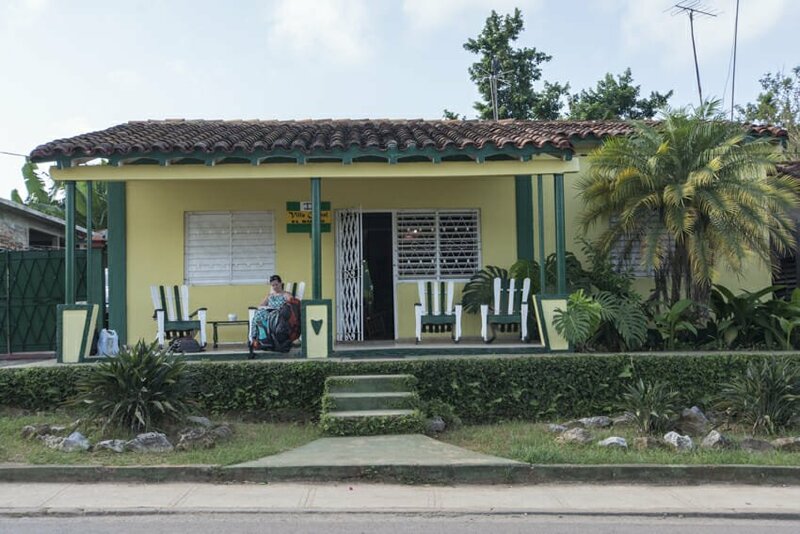 This post will give you a heads up about casas and how they work, as well as some recommendations of where to stay from our recent trip to Cuba. See more about the places we visited here. 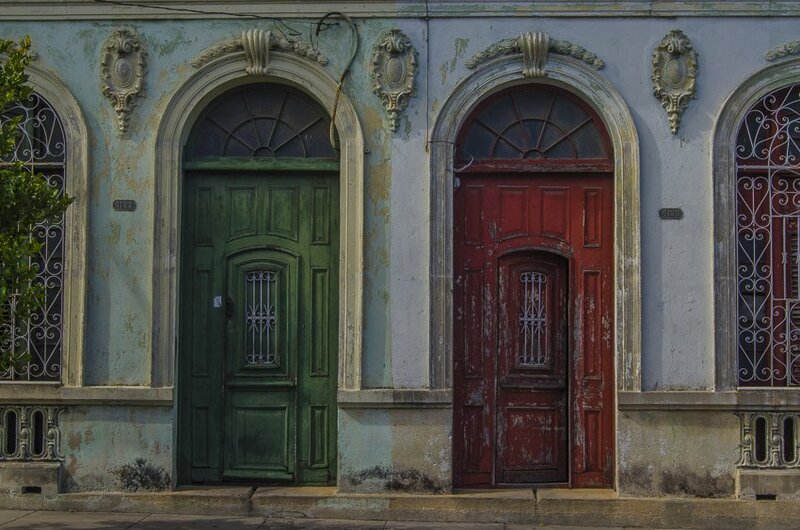 What are casas particulares anyway? 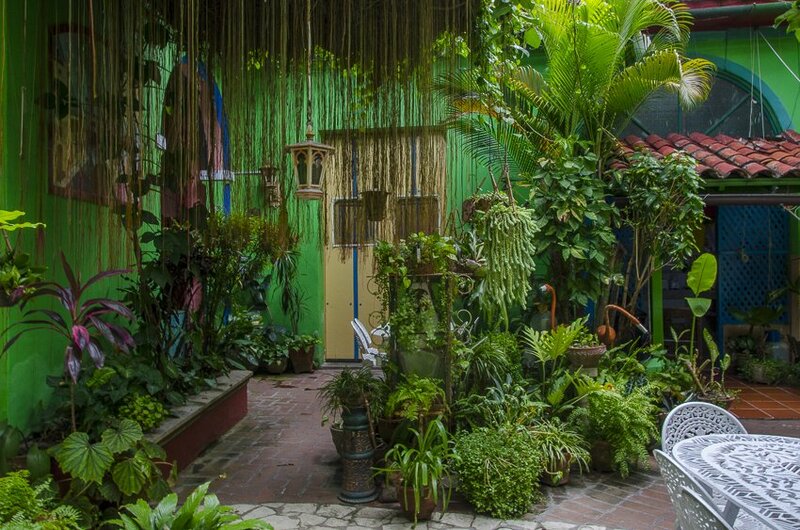 A casa particular is basically a home stay. People simply rent one or more rooms in their house. It is easy to find an official casa because there will be a sign at the front of the house. You can pay for a bed and hence share a room with others or rent an entire room. 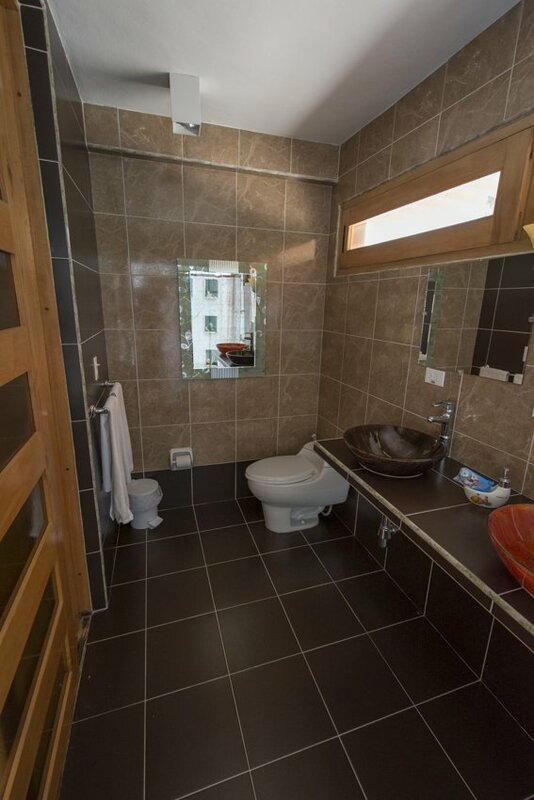 You may have to share a bathroom or if you are willing to pay a bit extra you can find a room with a private bathroom. 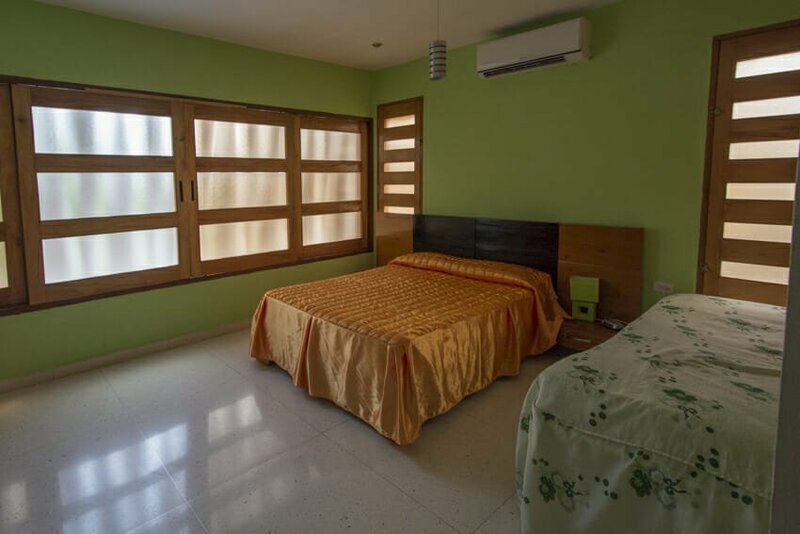 The better rooms will also include air conditioning (necessary if you are visiting during summer). 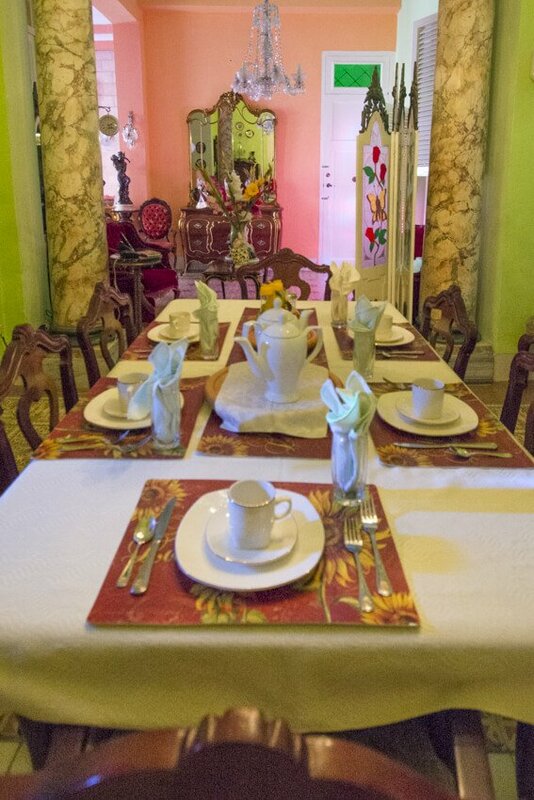 We chose to pre-book all of our casas ahead of time since it was high season when we visited. This meant that we didn’t negotiate any of the prices of our rooms. 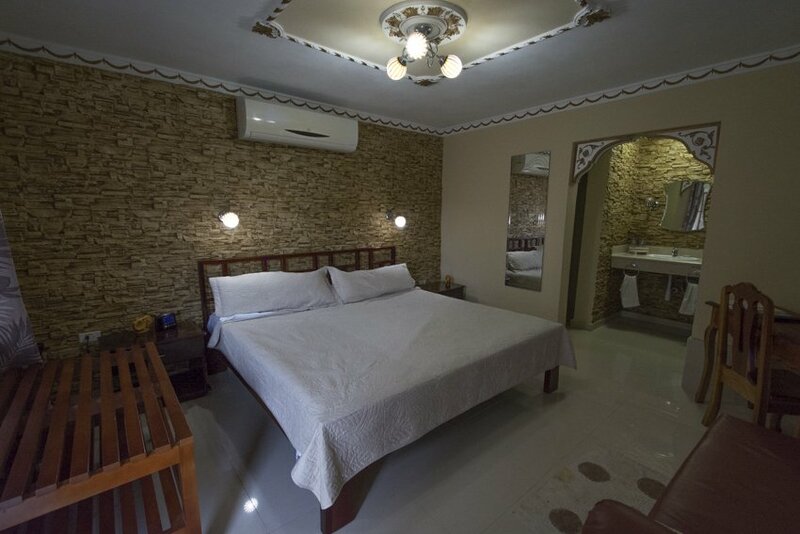 We didn’t want to compromise on air conditioning or a room with a private bathroom either, this also meant that we didn’t always pay the cheapest price for our rooms. All of the casas we stayed in were in the range of 25 – 35 CUC (25USD – 35USD). It was also high season so prices can go down during certain times of the year. 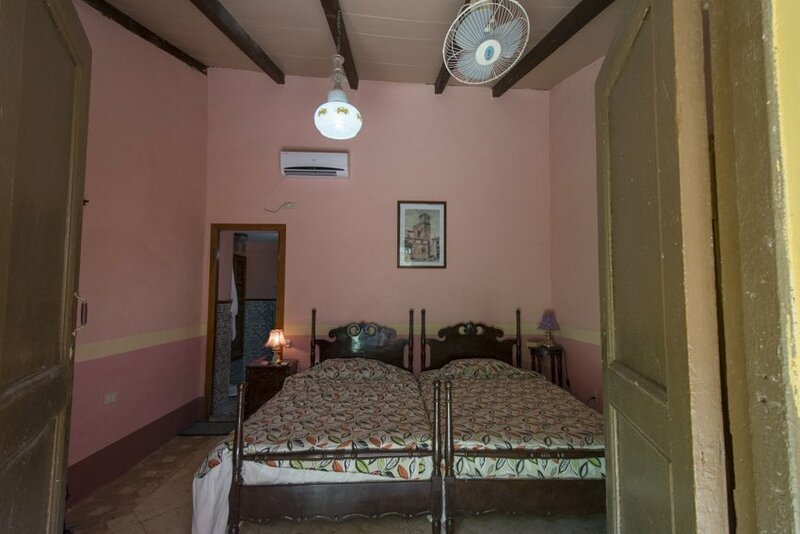 If you don’t want to pre-book accommodation you can ask your casa owner to recommend one for the next town you are heading to, many travellers use this system and luckily everyone in Cuba knows someone who can help you out, even the taxi driver. Otherwise you can wander up to any house with the official casa sign and ask if they have a vacancy. 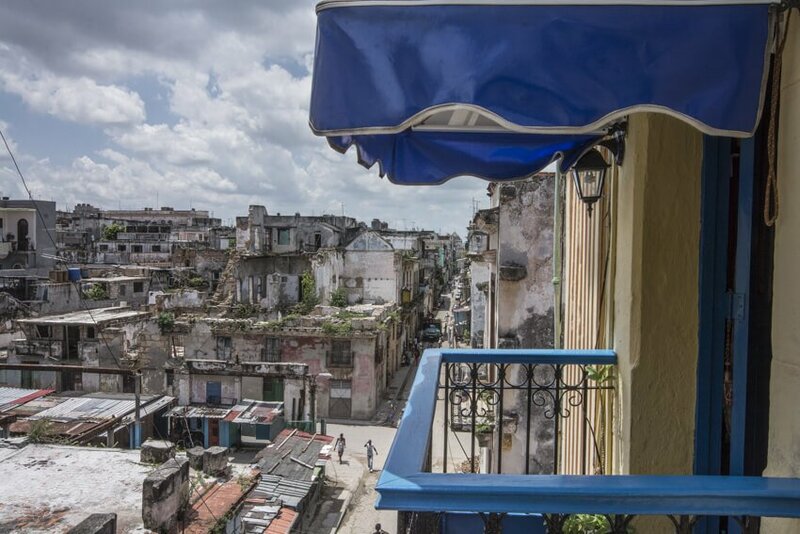 A word of warning, if you count solely on Lonely Planet for recommendations (as pretty much every tourist in Cuba has a copy) you may be disappointed. 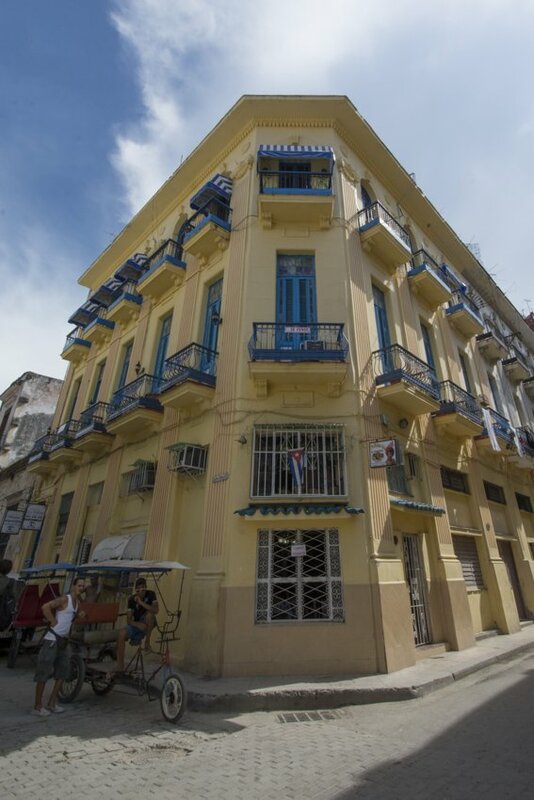 Other options that are good online sources include Cuba Junky, Airbnb (recently opened in Cuba) and homestay. 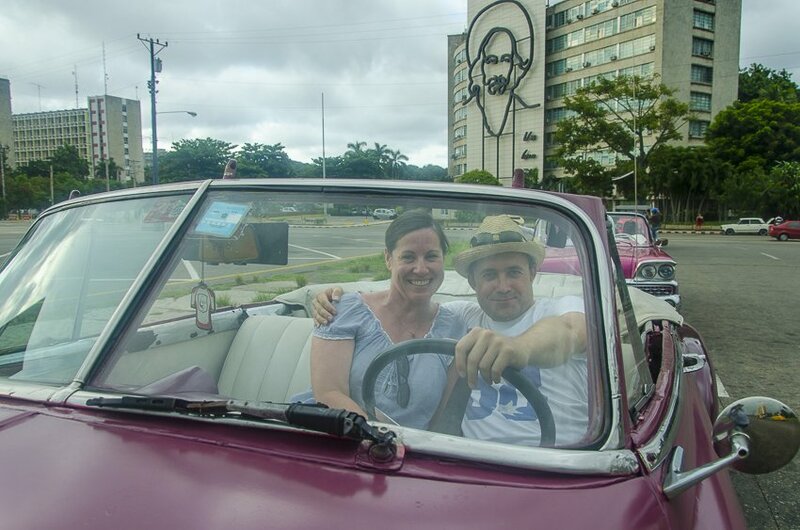 We used Cuba Junky, Airbnb and the Lonely Planet book for guidance and they all proved to be excellent sources. Fair warning, be wary of Jineteros! Be careful of scams, especially when arriving by bus. 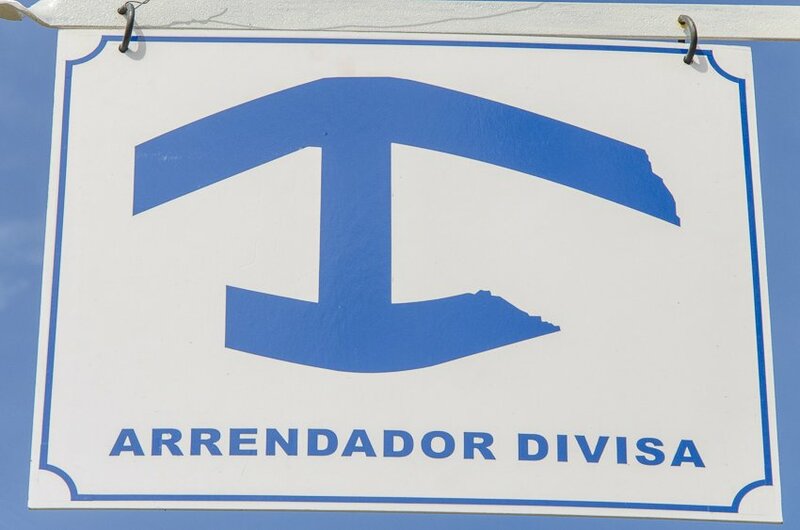 Jineteros (touts) are rife in some towns and will try and tell you that your casa is full and will kindly offer to take you to another one (they get a commission for this that you have to pay). Never tell anyone where you are staying! When you arrive at a casa always ask for under which name they have a reservation. Some casa owners will offer to meet you at the bus station with a sign with your name on it or will send a taxi for you (that you will have to pay for). We also printed pictures of each casa that we booked online so we knew what each house looked like in advance. In nearly all of the casas we stayed in breakfast was offered at 5CUC (1CUC = 1USD) per person. 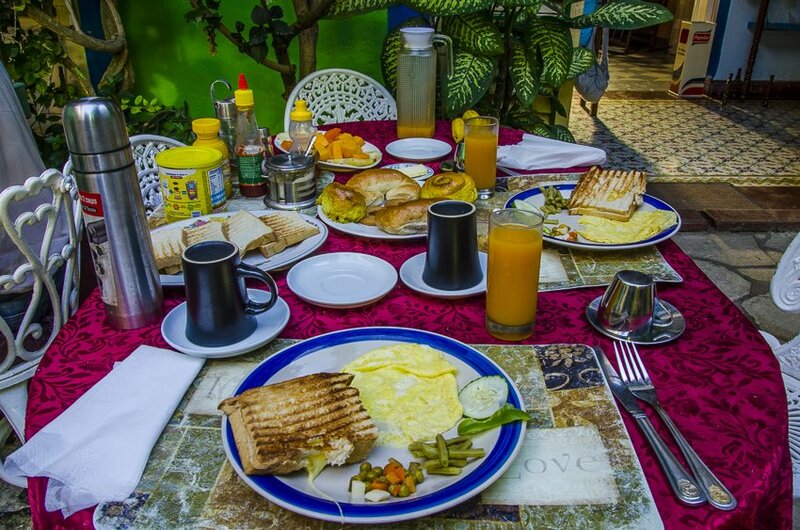 The standard breakfast consisted of a minimum of a plate of fresh tropical fruit (mango, pineapple, papaya and sometimes guava), eggs, bread, juice, tea and coffee. However, some places offered much more than this. 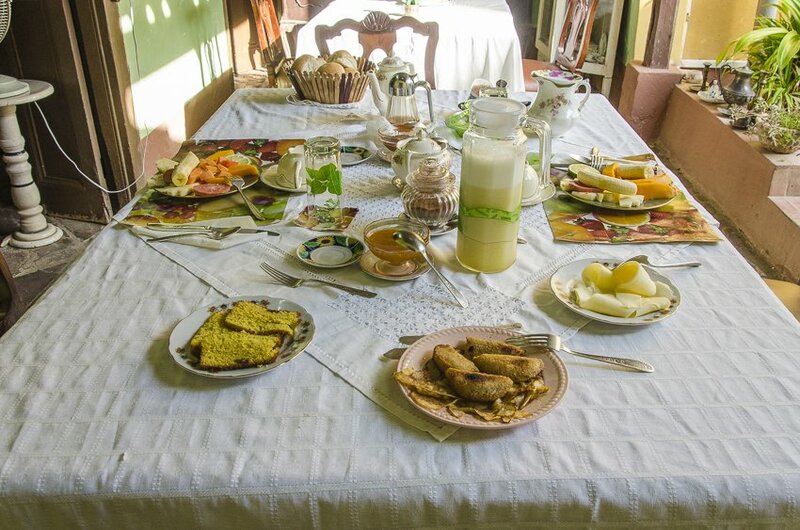 Don’t forget that a variety of food is not always available in Cuba, they do live on rations, hence the reason why the breakfast is pretty standard. It is also pretty standard that bathrooms have hot water these days. However, the water pressure varies from casa to casa so don’t assume you will have an amazing shower in every casa. Some of our favourite casas had the worst water pressure, barely more than a trickle, but that is out of the control of the individual. Cuba is a developing country so keep that in mind. Washing was normally available even if it was not advertised. It is normally carried out by the helper, if there is one, and you pay her directly. She also determines the price which is dictated by the amount to be washed. We found that the washing was returned the next day or even the same day in one case. We paid from 5 CUC – 10 CUC. All of the casas that we stayed in were very clean and comfortable and our hosts were all incredibly welcoming. 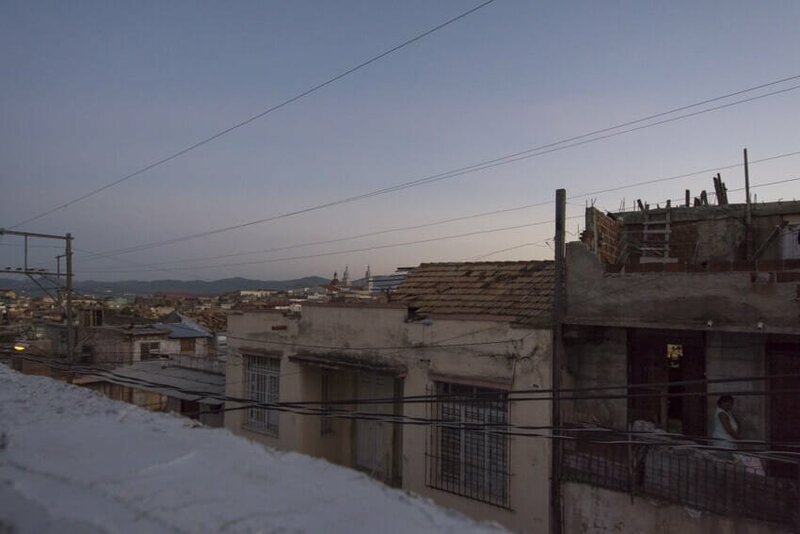 Below you will find a brief overview of the casas we stayed at. We would recommend each of them to you. Fina and Daniel were wonderful hosts. Fina sat us down upon arrival and pointed out all the main sites on a map for us, as well as preparing cold, complimentary, freshly squeezed guava juice which was greatly appreciated considering the heat. They are lovely people and provided a good insight into Cuban life. Their apartment is on one side and they rent out the other side. There was a good balance between social interaction with us and providing us with suitable privacy. There is a shared kitchen containing a refrigerator and several rooms for rent. 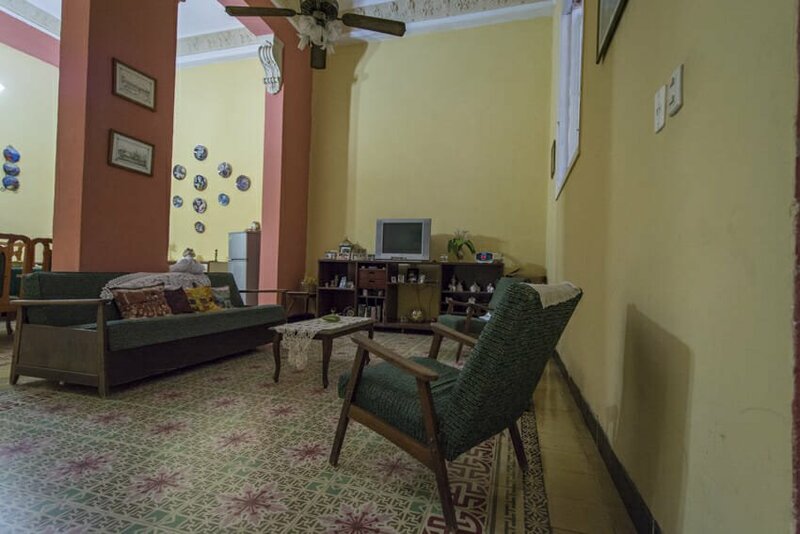 The apartment is in a good location in Havana Centro, 5 minutes to the Malecón, a 15 minute walk to Capitol or a 1 – 2 CUC bici taxi ride to Havana Vieja. Ani and Fransisco were incredibly accommodating and were always checking if we were comfortable. They both speak good English. 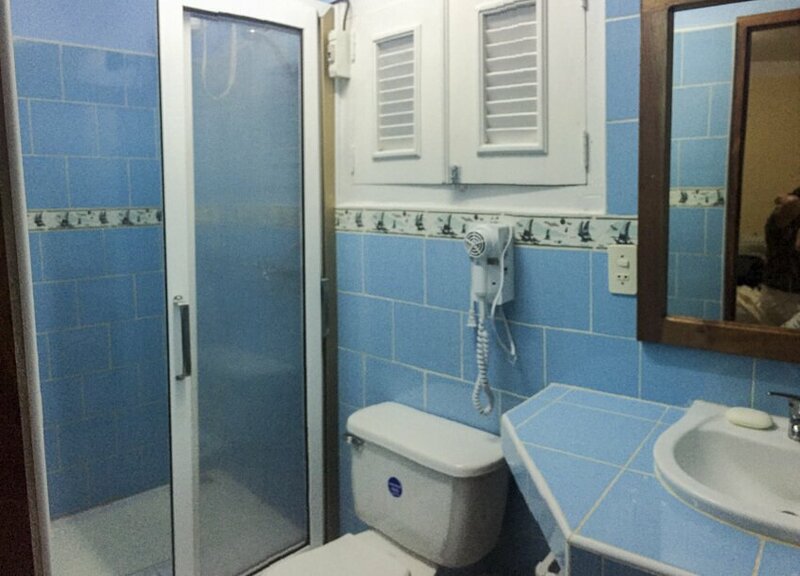 They have two rooms to rent behind the main house which are very modern (particularly for Cuban standards), with a hair dryer, safe and mini-bar. The rainforest shower head in our room provided the best shower of the whole trip. 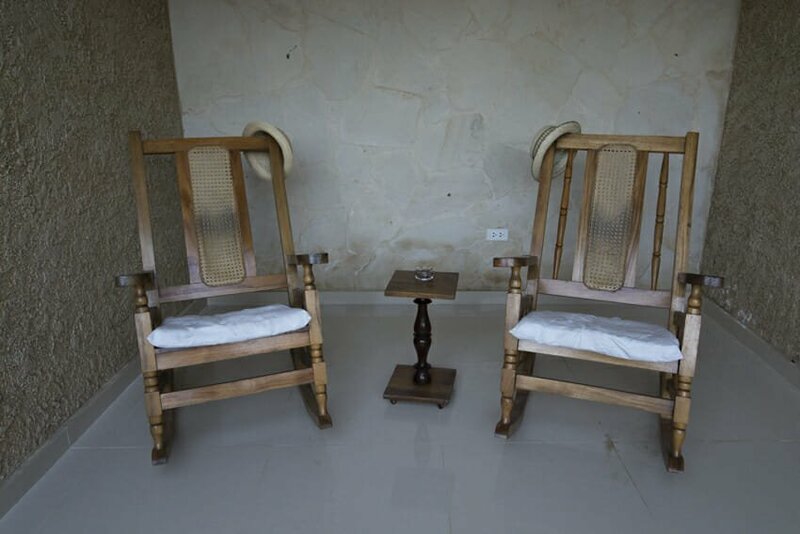 Each room has their own verandah with rocking chairs. 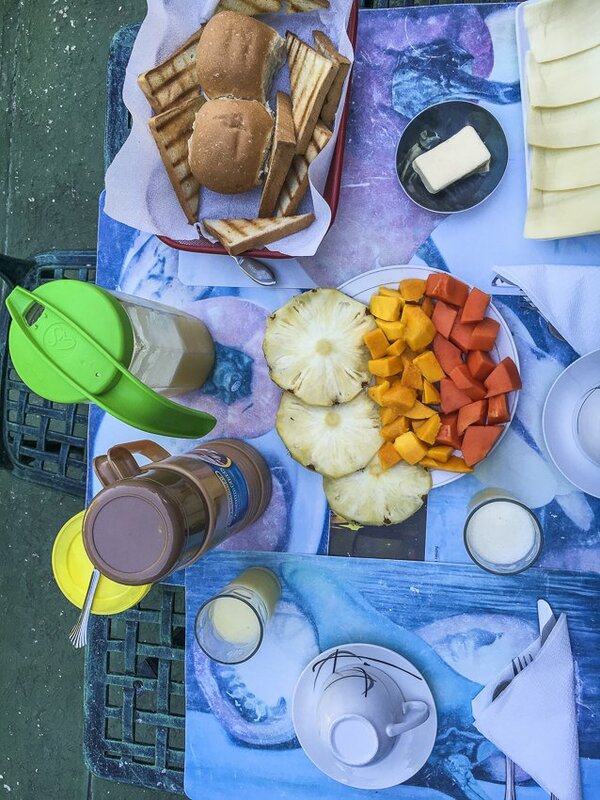 The breakfast, which additionally included cheese and ham, pancakes, peanut butter and dulce de guava (guava jam) and was served in a lovely outdoor area. 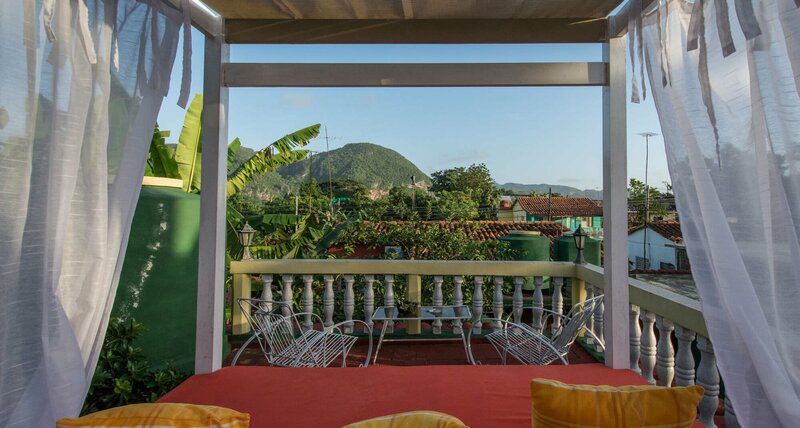 Viñales is not a big town but still this casa is in an excellent location. We were offered to have laundry done but didn’t take up the offer. 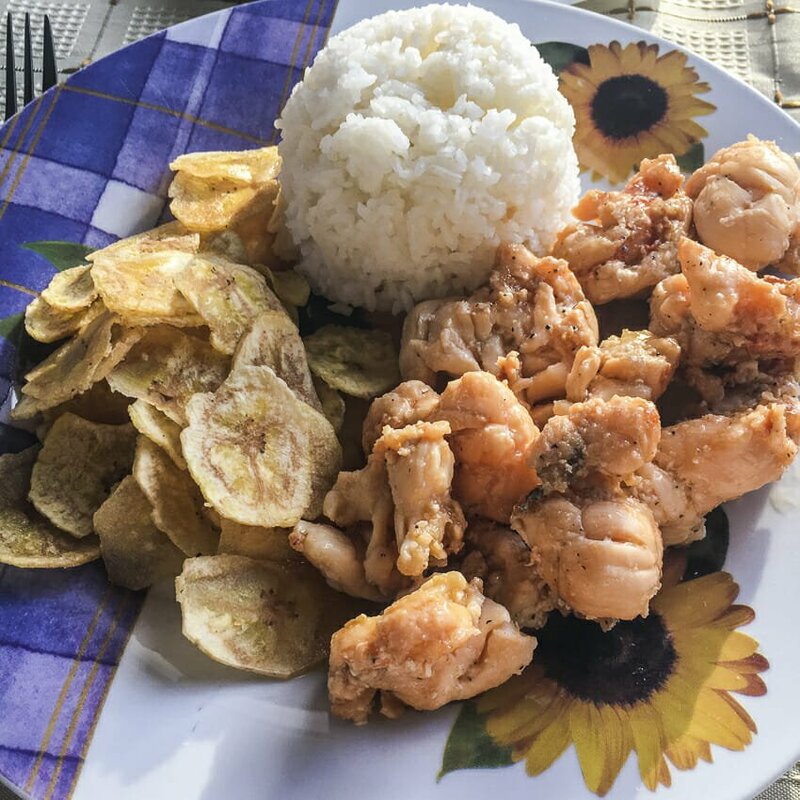 We ate a seafood dinner at the casa one time and it was delicious, it costs 10 – 12 CUC depending on what you order. The cocktails were also really good, top five on our mojito list. The ultimate perk was the CD of Cuban music that they gave us upon leaving. Angela and her mum were always happy to answer our questions and give advice on prices. They offered David and me, as well as our friends who were looking for a casa, a complimentary beer on arrival. They were also very helpful in finding our friends a lovely casa. Their very modern house is spacious and the two rooms they rent take up all of the second floor. Breakfast additionally included cheese and toast (a bit of western breakfast reprieve). There is a mango tree in the backyard which ensures that you get fresh mango and freshly squeezed mango juice for breakfast everyday,YUM! I should mention that mango is my favourite fruit in the whole wide world. We paid for washing to be done here and it cost 5 CUC for a small plastic bag but the next day she also washed our pyjamas without us asking which was very sweet (or they smelt pretty rancid that she felt compelled to do so). They were very happy to call us a taxi to the bus station, which is out of town, which was reasonably priced. 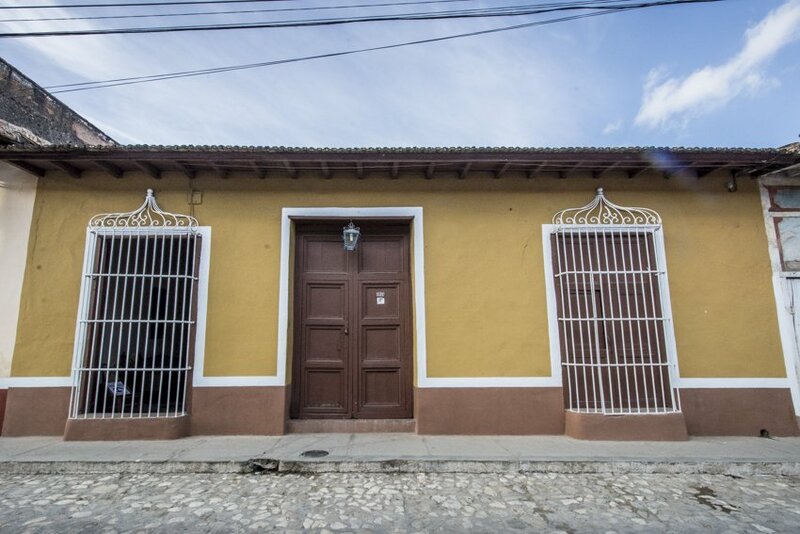 The house is a little out of the main town of Cienfuegos (about a 15 – 20 minute walk) but lies approximately half way between the town centre and Punta Gorda and just a 5 minute walk to the Malecón. It was in a local area so we really felt like we were living within a normal Cuban neighbourhood. Rogelio and Rosa Maria, two retired doctors, made us feel completely part of their family. Rogelio speaks some English and Rosa Maria makes herself understood in Spanish. There are two rooms situated around a lovely courtyard that has an outdoor kitchen and the third is off the living room. Their helper, Rosita, who looked after us at breakfast, was also delightful. She did our washing for 6.60CUC for a large bag of washing. Breakfast was out of this world, so big that we didn’t normally eat lunch. 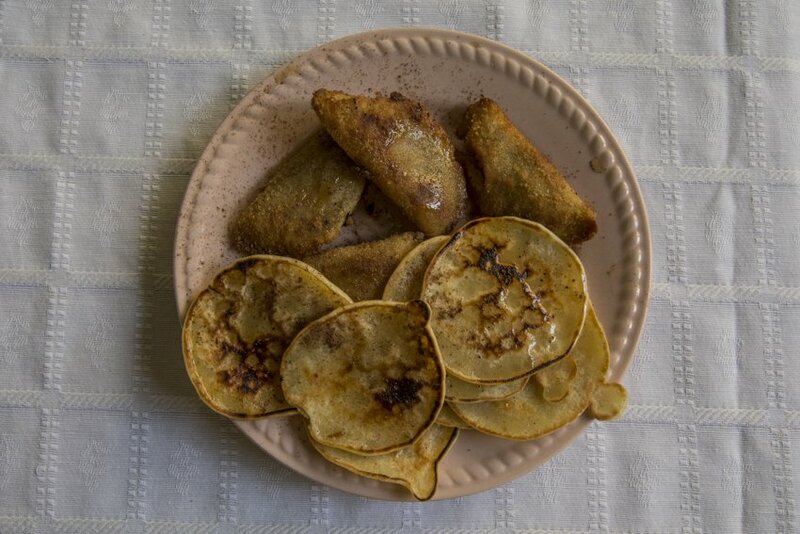 It included crisoles (fried pastry delicacy filled with either coconut, pineapple or guava puree or savoury options like ham, cheese or chorizo), mini pancakes and jam-like spreads (mango and guava) that were great with cheese on bread. When we mentioned that our favorite fruit was mango (mine) and papaya (David’s) another plate of fruit containing only mango and papaya plus another jug of freshly squeezed half mango and half papaya appeared. We were very happy campers! On our last morning Rosa Maria hadn’t received a third jam-like spread (coconut) in time for breakfast so later in the day she made us a scrumptious coconut dessert out of it instead. Rogelio was happy to take us down the road and introduce us to the dance school where we took salsa lessons. These little extras really made it a lovely stay. 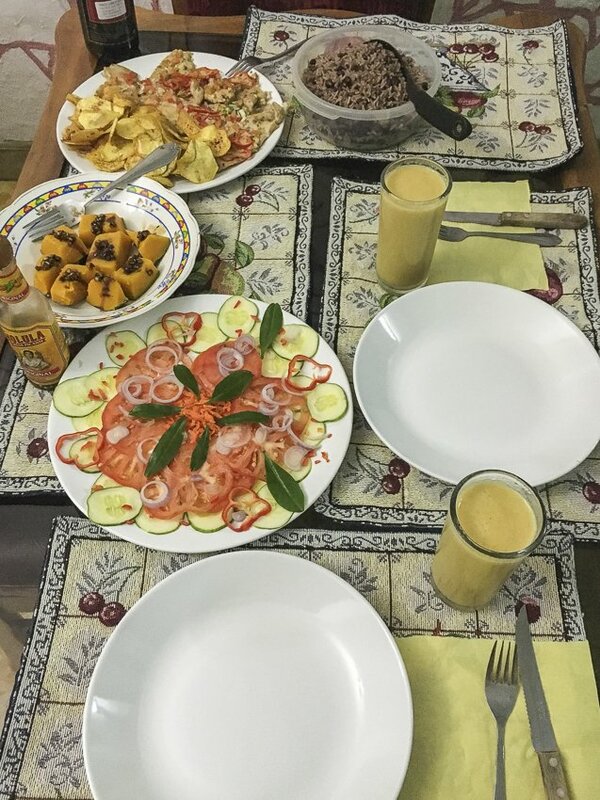 We had dinner at the casa once and José was a phenomenal cook (whom they obtain on demand) . As per Rogelio’s recommendation, we had a whole fish in a salt crust which costs 15 CUC each but the more than ample 3-course meal was well and truly worth it. If you can’t already tell, this was our favourite casa that we stayed at. An added bonus was that it was in a superb location, close to Plaza Mayor, a supermarket and taxis. Mercy and Omelio were very accommodating hosts who were willing to help at any time and were very professional. Omelio speaks English and gave us plenty of tips of where to go on arrival and organised a moto-taxi for us on arrival and departure. The two rooms they rent are on the second floor. Each room has its own bathroom but opposite the room and contained a hairdryer, safe and mini-bar. Dinner was good value for 10 – 12 CUC, depending on what you have. There is a beautiful two-level terrace for guests as well as one on the ground floor where breakfast is served. The location is excellent, only one block from Parque Vidal. The added bonus is the extensive cocktail menu that contains plenty of delicious rum-based beverages. 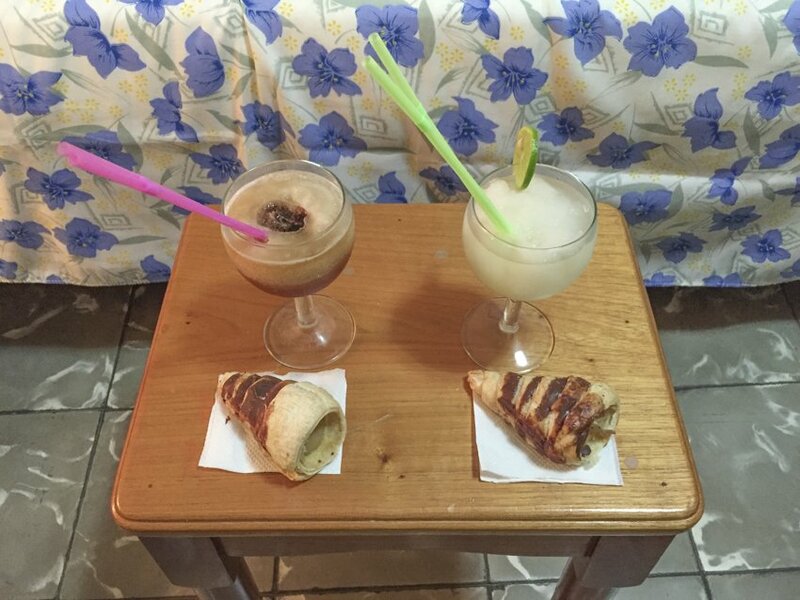 Yummy cocktails and a pastry for merienda. Rafael and Emma were brilliant hosts. Rafael speaks English. He showed us all the good sites on our map when we arrived and made us feel very welcome throughout our stay. 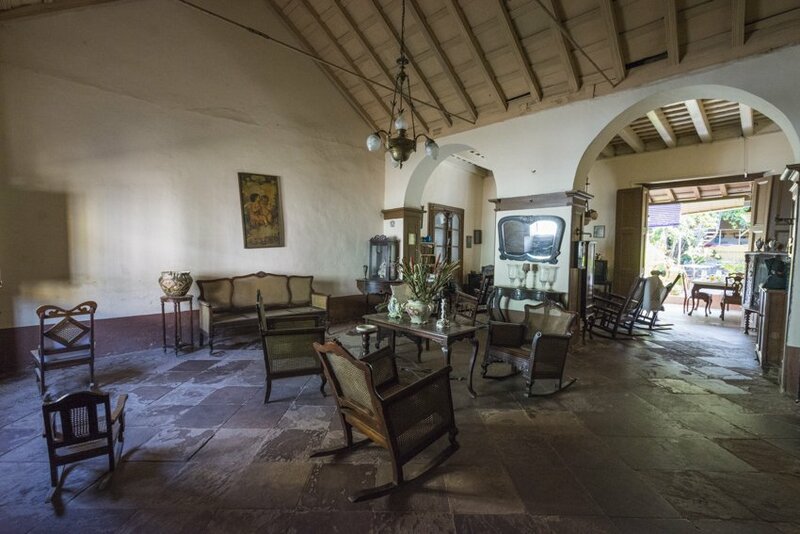 The house is an enchanting colonial style with incredibly high ceilings, filled with antique furniture. It used to be a convent many years ago. The three rooms they rent out are situated around an exquisite courtyard filled with plants and a fish pond, where breakfast is served. The room contained a hair dryer, tv and mini-bar. It had an interesting electric shower that produced random sparks, living life dangerously. The massive breakfast was remarkable, additionally including toasted cheese sandwiches, toast and a selection of pastries. We used the laundry service which cost us 10 CUC for two large bags. The house is in a good location, just around the corner from Parque Marti, and the dinner was delightful. Maira and Imilsis were like our Cuban mamas, they were both lovely. Always checking if we were ok, especially when David had his turn with Cuba belly. They were always willing to have a good chat and make you feel part of the family. The room was small but comfortable with a fridge and hair dryer as well as a terrace that was destroyed during the 2012 Hurricane Sandy. They offered the cheapest breakfast (4 CUC) and dinner (6 CUC) compared to any of the other places we stayed in. Washing was available but we didn’t use the service. They were sweet enough to organise a taxi to the beach and airport and gave us a small trinket when we were leaving. They allowed us to give back one bottle of water that we didn’t use and also discounted our last breakfast since we only had fruit because we left for our flight so early. 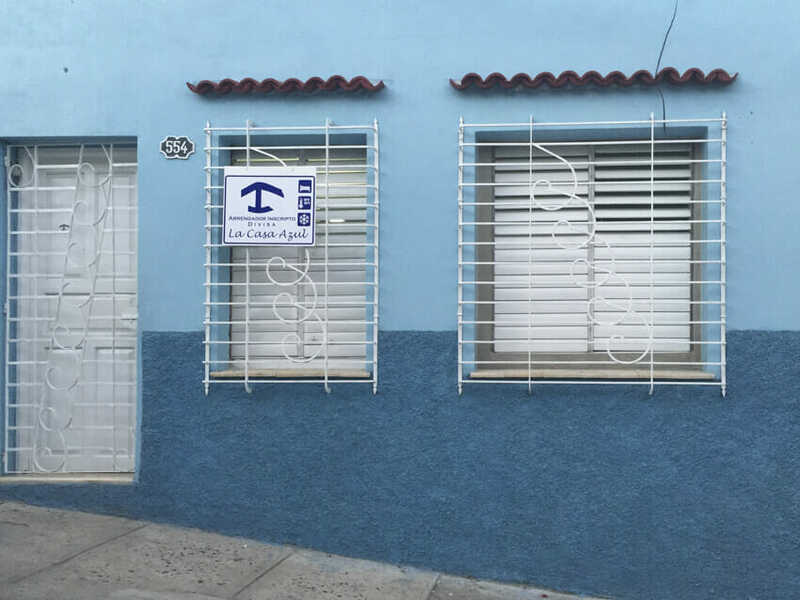 This casa is in a good location, in a local neighbourhood, but only 10 minutes from Plaza Céspedes. Surama was born in this second floor (narrow, steep stairs, not ideal for carrying a suitcase up) beautiful apartment that is filled with antique furniture and paraphernalia. She collects antiques as a hobby. There are three rooms available that all have a small terrace where you can people watch those below. There was a hair dryer, safe and mini-bar in the room. It was the most expensive casa we stayed in but also the fanciest. 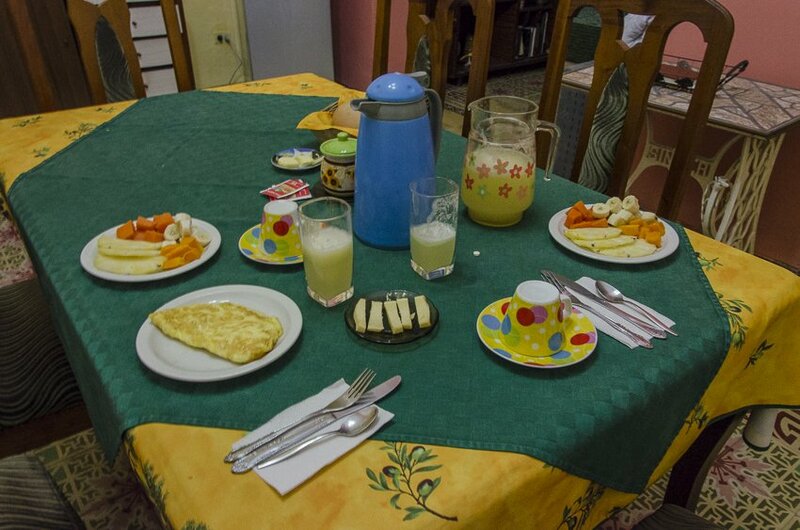 The breakfast included bread, eggs, avocado, tomato and cucumber as well as cheese and ham on the first day. Surama is a doctor and gave David some good advice about what to eat to help his Cuba belly. She was also kind enough to organise a taxi to the airport for us and to let us shower before we left even though we had already checked out. 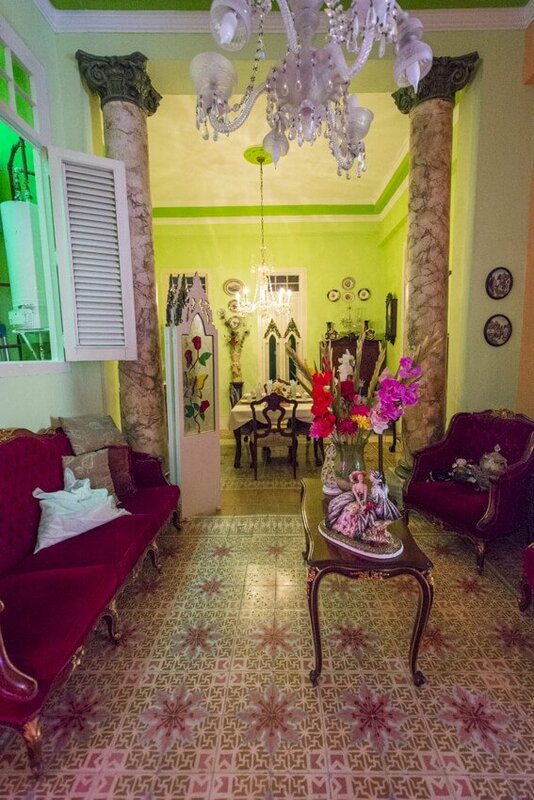 This casa has to be one of the best located in Havana, literally one block from Plaza Vieja. 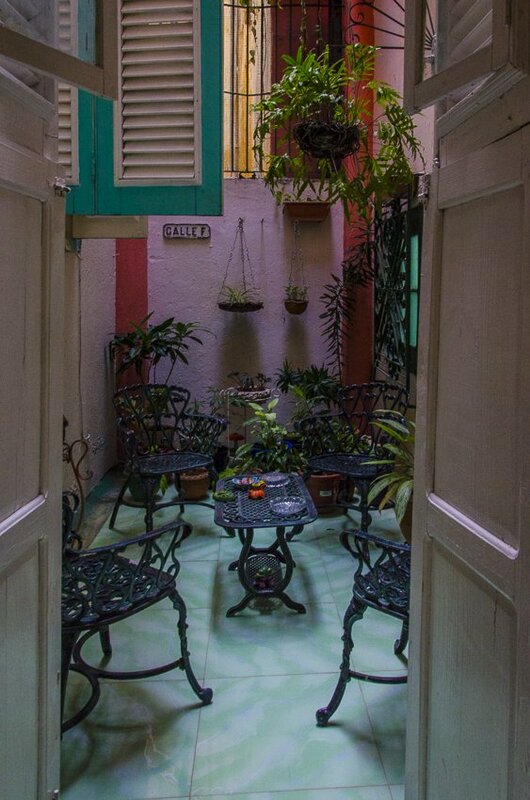 Overall, we were incredibly happy with all of our casas and cannot recommend enough that you stay in any of them if you find yourself in Cuba. They allow you to see a slice of “the real Cuba” as opposed the tourist touts, souvenir shops and sights. Have you been to Cuba? Do you have any other good casa recommendations? Let us know in the comments if you have any questions or advice to give. 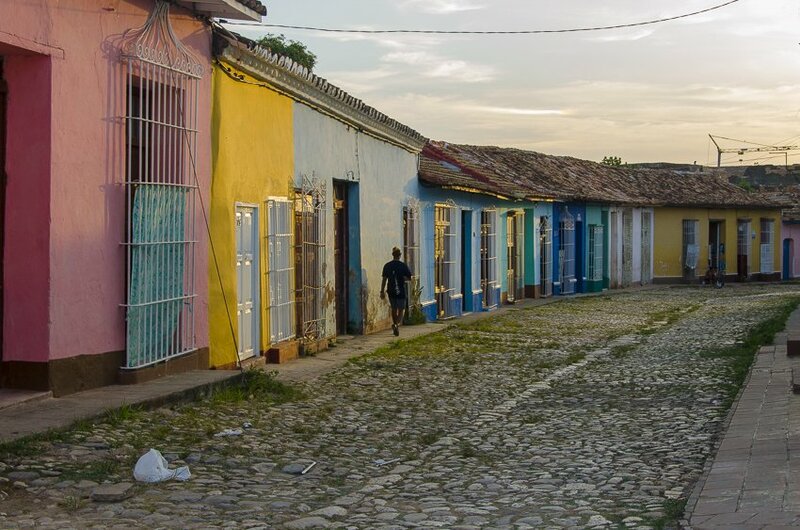 One Comment on “Why You Should Choose to Stay in Casas Particulares in Cuba”. Join the Conversation Below!